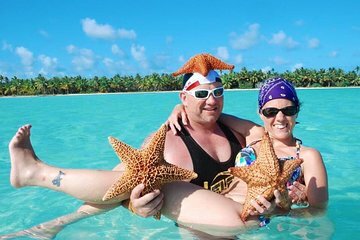 Sail from Bayahibe to Saona Island aboard a catamaran for a leisurely day on the beach during this full-day tour. Go swimming, lounge on the beach, or take a dance class from the boat's crew. Return to Bayahibe via speedboat, stopping at the Natural Pool on the way back. Buffet lunch, unlimited drinks, and round-trip transportation from Punta Cana hotels included. going to Saona Island is always a pleasure , it just seems like there lacking ... but overall a good trip and a must see and do when in DR ! For the amount we paid this was a great experience. The place is beautiful. I recommend it and bring lots of sunscreen. We were staying at Now Larimar and were picked up on time. The only confusion is the transferring of buses. That is the only thing I didn't like. One bus picks you up, they make a stop at a gas station and have you wait there and then another takes you. It was a bit crowded in the bus as well. It's a long trip because of the transportation. Would I do it again probably not. Once is enough. When you get to the Island you will be attacked with people trying to sell you coco oil, massages, and jewels. If you aren't interested in any of that just say it as soon as you get there. We were on the beach for about 2 hours. Please bring cash and tip the people who help you on the boats, very nice people. About the Tour Company: was very responsible, they picked us up a bit late because a hotel confusion, I was staying at Bahia Principe Fantasia and it is a very large complex with different hotels. About the Tour: It is very beautiful, it was a nice experience. What I did not like was all the people trying to sell you stuff, handmade jewelry, massages, pictures, ect. The beach is a bit rocky.. but after Saona Island they take you to a natural swimming pool, this was my favorite part, is absolutely amazing, water is crystal clear. The bad part is they leave you here for only about 30 minutes, I wish the whole tour was in this area..